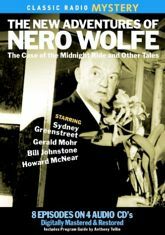 Based on the famous detective created by Rex Stout, The New Adventures of Nero Wolfe stars Sydney Greenstreet as "the balkiest, bulkiest, smartest, and most unpredictable detective in the world... that brilliant eccentric private detective, orchid fancier and gargantuan gourmet." Nero Wolfe, armchair detective in the classic tradition, and Archie Goodwin, wisecracking hard-boiled investigator, shine in eight radio tales from this classic detective series first broadcast in 1950-1951. Co-stars include Howard McNear, Gerald Mohr, Bill Johnstone, Harry Bartell, Larry Dobkin and Lamont Johnson.